CROWDS AT THE WILD WEST SHOW. The Exhibition at Ambrose Park Continues to be Well Patronized. 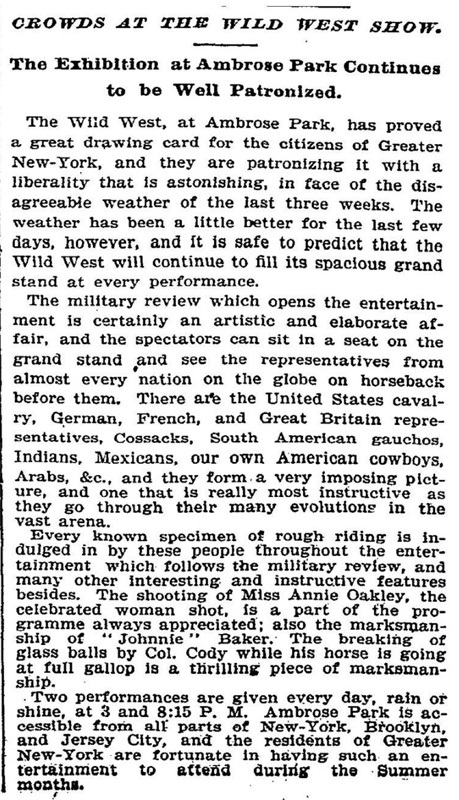 The Wild West, at Ambrose Park, has proved a great drawing card for the citizens of Greater New-York, and they are patronizing it with a liberality that is astonishing, in face of the disagreeable weather of the last three weeks. The weather has been a little better for the last few days, however, and it is safe to predict that the Wild West will continue to fill its spacious grand stand at every performance. The military review which opens the entertainment is certainly an artistic and elaborate affair, and the spectators can sit in a seat on the grand stand and see the representatives from almost every nation on the globe on horseback before them. There are the United States cavalry, German, French, and Great Britain representatives, Cossacks, South American gauchos, Indians, Mexicans, our own American cowboys, Arabs, &c., and they form a very imposing picture, and one that is really most instructive as they go through their many evolutions in the vast arena. Every known specimen of rough riding is indulged in by these people throughout the entertainment which follows the military review, and many other interesting and instructive features besides. The shooting of Miss Annie Oakley, the celebrated woman shot, is a part of the programme always appreciated; also the marksmanship of "Johnnie" Baker. The breaking of glass balls by Col. Cody while his horse is going at full gallop is a thrilling piece of marksmanship. Two performances are given every day, rain or shine, at 3 and 8:15 P. M. Ambrose Park is accessible from all parts of New-York, Brooklyn, and Jersey City, and the residents of Greater New-York are fortunate in having such an entertainment to attend during the Summer months.